From its enviable location overlooking the Mawddach Estuary, Graig Wen is one of Snowdonia's most spectacularly located campsites. 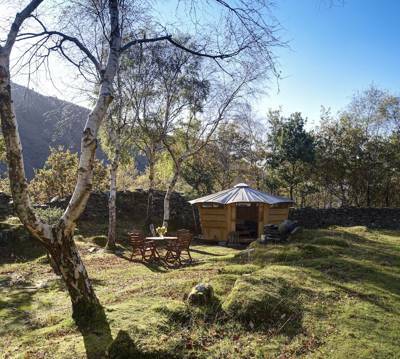 Whether pitching up your tent on the verdant bluff, or settling for one of the luxury yurts in a secluded meadow; peace, tranquility and outstanding views are promised at this North Wales hideaway. The newest addition to the site is the charming Caban in the Glade. This hand-crafted wooden pavilion – one of only 3 in the UK – sits hidden in a lush, grassy dell surrounded by silver birch and oak trees. The Caban comes with a luxurious double futon bed, wooly Welsh blankets, wood burning stove, and private campfire to keep you warm while admiring the unspoilt night skies. Win a 2-night stay at graig wen's Caban in the Glade! For your chance to win a 2-night stay in this romantic retreat, breakfast (including Snowdonia honey from the farm next door!) and free tickets to one of the region's most popular attractions, simply leave a review on the Cool Camping website. It's that simple - every new campsite review counts as an entry, and there is no limit to the number of entries you can have. So get reviewing, and good luck! Competition ends 18th May 2014. See below for full terms and conditions. 3. Competition Details. In order to qualify for this competition, entrants must submit a user review (50 words minimum) via the www.coolcamping.co.uk website, based on any campsite or place listed on either website. The competition will begin at one minute past midnight (00.01) in the early morning of Tuesday 15th April 2014. Any reviews submitted before that time will not be eligible. 3. 1 Reviews must meet the standard website terms/guidelines which can be found here. Any reviews that contain false information or offensive language will be removed and automatically excluded from the competition. Reviews do not necessarily have to be positive or complimentary in order to be eligible. 3. 2 You may enter as many times as you wish, but each entry must be a separate review submitted via www.coolcamping.co.uk. Multiple reviews of the same place will not be treated as separate entries and will be excluded from the competition. 3. 3 The closing date for this promotion is 18th May 2014. Any reviews submitted after this date will not be eligible. Reviews received up until midnight on 18th May will be eligible. 3. 4 We accept no responsibility for damage or loss resulting from misdirected or incomplete entries arising from computer malfunction, viruses, bugs or telephone malfunction or other such causes. We are in no way liable for the reproduction or indirect access via third party websites which misstates or omits any of the information or terms and conditions connected with the promotion. 3. 5 The winning review will be selected at random from all reviews submitted, within 7 days of the closing date. 3. 6 The winner will be notified via email within 28 days. The name of the winner may be published on the www.coolcamping.co.uk websites, and may be used in other marketing emails. 4. Prize Details. Prize consists of a 2-night break for 2 people to stay in the Caban in the Glade between 5th & 23rd May or 2nd & 25th June. The offer includes breakfast croissants and a pot of local Snowdonia honey and free tickets to the Centre for Alternative Technology. Bedding is supplied. Prize does not include travel to or from any of the locations. This competition is promoted by Punk Publishing Ltd, 3 The Yard, Pegasus Place, London SE11 5SD. Entries should not be sent to this address.